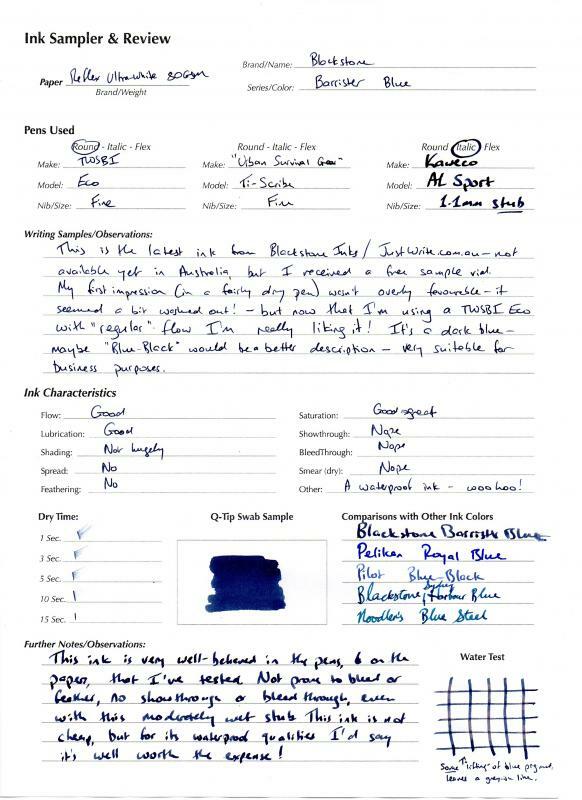 A bit over a month ago now (I think) I placed an order with Kevin from Just Write Pens (www.justwrite.com.au), and with my order received a sample vial of his latest 'Blackstone' branded ink. I've held off on publishing a review until now, because it didn't appear to be have been released yet - but I understand it's now available through Anderson Pens (and others?) in the US. Due to supply issues (of nalgene bottles) the ink is not yet available in Australia, but I'm hoping that will be rectified soon - I'm keen to order a bottle! Like Barrister Black, Barrister Blue is a 'permanent' ink - though as you'll see (when I get around to appending some pictures) it's not completely "bulletproof". 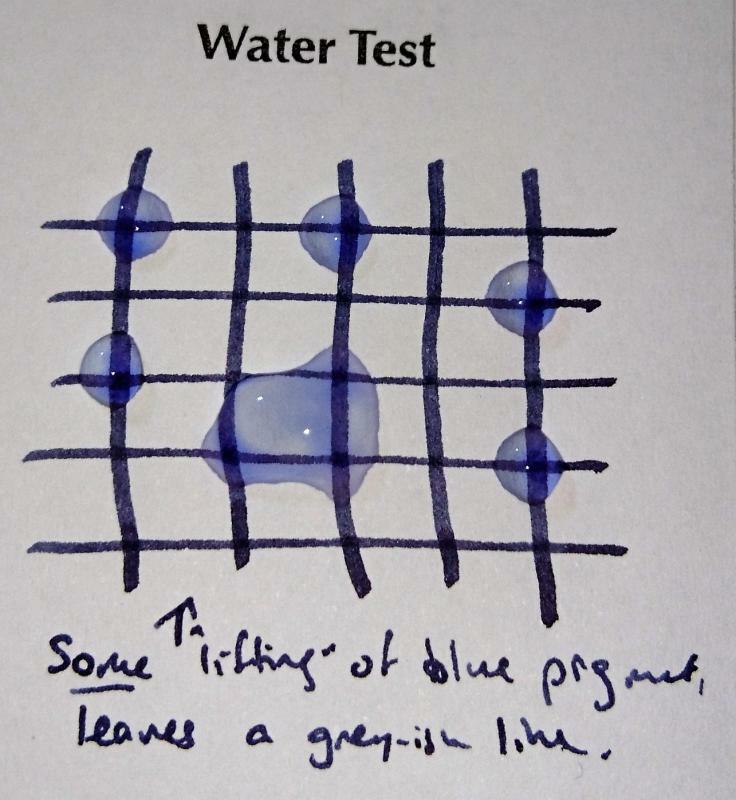 A small amount of blue ink washes away in water, leaving a solid line of blue-grey ink. 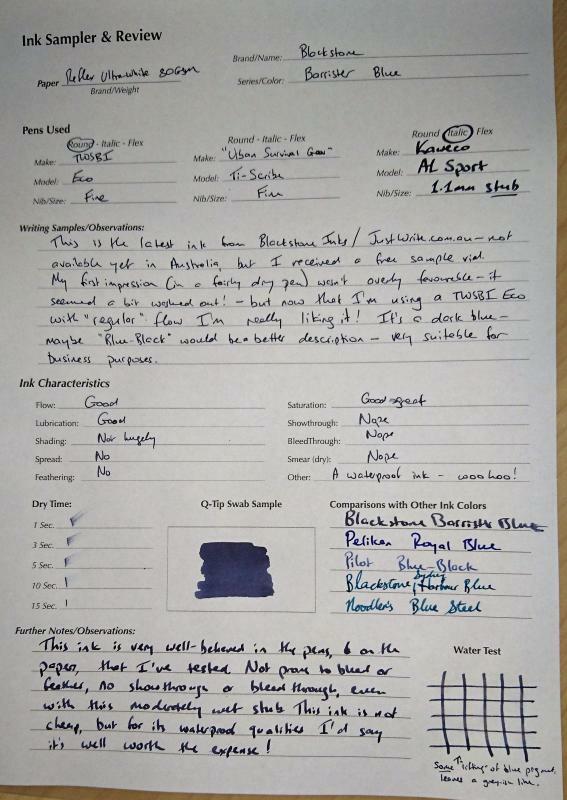 Unlike the 'Colours of Australia' inks (which are non-waterfast), Barrister Blue is a 'serious' ink rather than a vibrant colour. It's a dark blue, almost a blue-black, that tends to darken further as it dries. I've been really impressed with it, though: it doesn't seem to dry out at all in my pens (I've tried it in 3); it's well-lubricated and flows very nicely onto the page; and it's not prone to feather, bleed or spread. Highly recommend this for anyone who wants a permanent / *almost* completely colourfast blue ink. Very nice! I like the touch of purple. The third picture: is that after the water drops in the second picture just dried out, or after the whole paper in picture 2 was completely suspended under water and then dried? The third picture was taken after blotting the water off with a piece of tissue paper - will immerse a writing sample and dry off tomorrow (if I get a chance), and post the result! Thanks. My first post wasn't meant as a tip to do so, it's just that if the ink is in fact a perm ink, then a complete wash might not look much more drenched out. The photo of the wet drops is in itself very informative as to what colours are the ones first (or at all) washed out (in this case blue). Not a problem - I was planning on doing an immersion test, just hadn't gotten around to it! OK, OK, I know I said I'd wait till tomorrow, but... I changed my mind. The text in the photo was allowed to dry (on Rhodia paper) for 1-2 min before I dunked it for ~5 min. As you can see, it's more grey than blue, but no question this is a pretty impressive permanent ink! Nice review, thanks. It's one of the new inks, right? You are absolutely right. That's a permanent ink for sure. And turning a bit grey is also okay (har, har). Hey Jamerelbe... You got it!!! I haven't posted my review since Kevin has not release it yet and I am scared he will change the formulation . Very reminiscent of that other immovable ink, Blue Upon The Plains of Abraham - the reddish purple hue when washed etc. Hi @Cyber6, I'd been holding fire too, till I received the latest newsletter from JustWrite Pens which indicated the ink was already available in the US, and confirmed this was the case at andersonpens.com. Still waiting impatiently for it to appear on the JustWrite website though! I don't really see any purple on the page - maybe that's a colour-correction problem? It reminds me a bit of Pilot Blue-Black, though it seems to be a bit darker. 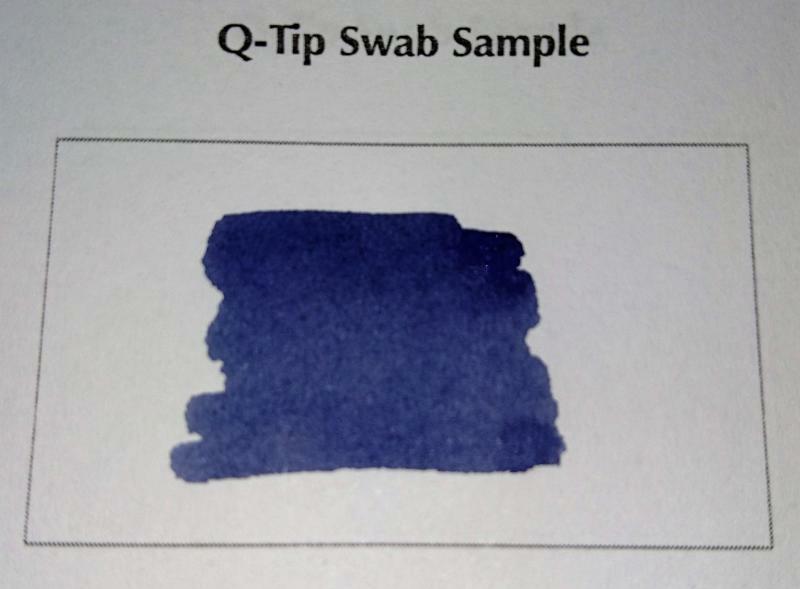 Maybe Diamine Registrar's ink too? - except that it lays down darker, and doesn't dry to almost-black! We've had a busy time since our last newsletter in April, trying to keep up with the demand for Blackstone Inks. Demand for our new Barrister Black took us by surprise and we have sold out several times already. We also ran out of Nalgene bottles but they are finally due to arrive early next week and we'll be packing up all the outstanding ink orders as soon as we get the bottles and get them filled. The release of Barrister Blue and Golden Wattle have been delayed because we ran out of bottles and we will probably release them next month now. I'd like to thank all of our ink customers for their patience and understanding with the delays and we will have them all dispatched early next week. We're also very excited that Blackstone Inks are now available in Europe at Appelboom and in the US at Anderson Pens. 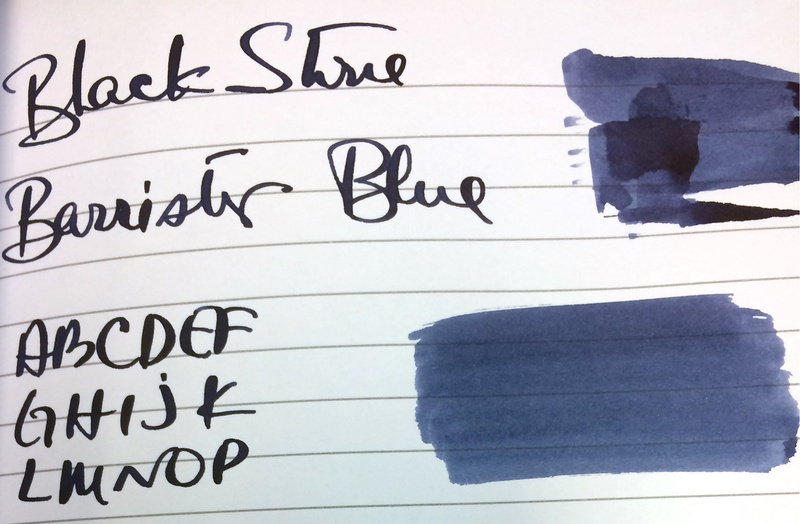 The unexpected demand for Blackstone inks has led to the strange situation where Australian made Golden Wattle and Barrister Blue are available in Europe and the US before we've been able to release them in Australia. Edited by Jamerelbe, 22 July 2016 - 02:49. @C - it really looks great on your photos. Tell us what pen do you use? 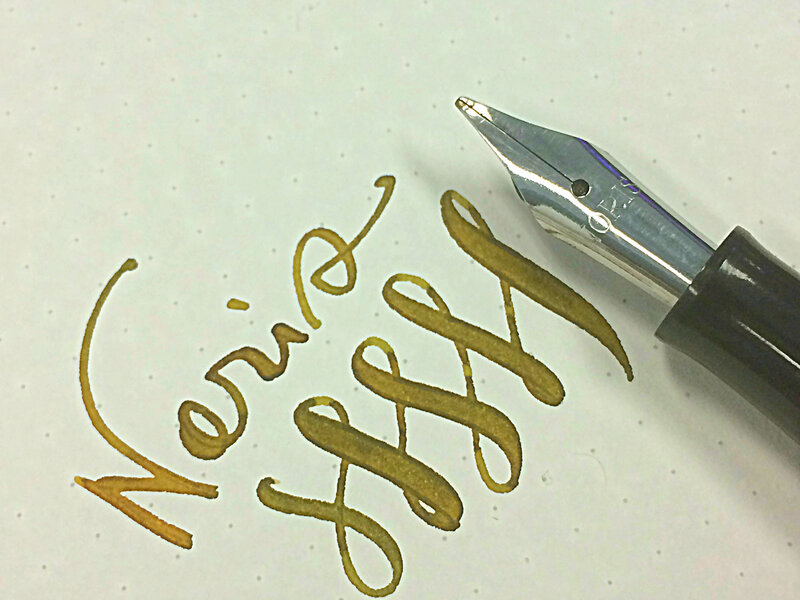 Old vintage German piston filler... Steel flex nib. Staedtler Noris. Been using it exclusively for my ink testing/reviews for 5 years..
Nice! This almost tempts me to try this in place of my workhorse Pilot Blue-Black that I use every day at work. As a physician, I have some natural apprehension about using an ink named after lawyers. As a pastor, I can sympathise with your sense of apprehension - but its billing rates are surprisingly reasonable, so I'd say it's worth the risk! Maybe we should ask if the manufacturer can customise the bottles for different professions? 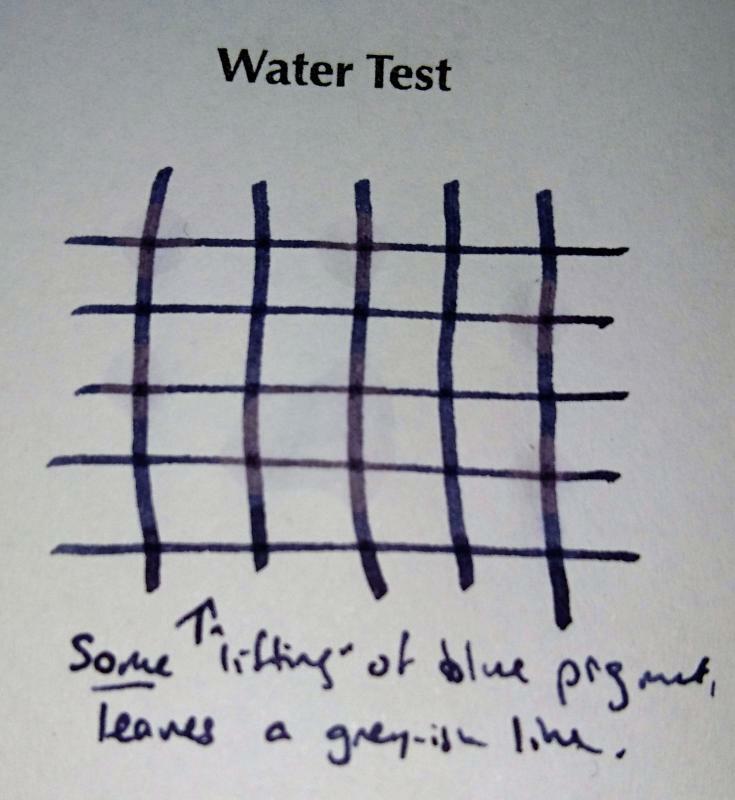 [Edited to add:] I received a sample of Pilot Blue-Black last year, having heard a lot of hype about it - but wasn't really blown away by it. I find it a bit dull - a little lacking in saturation, at least in the pens I tried it in. 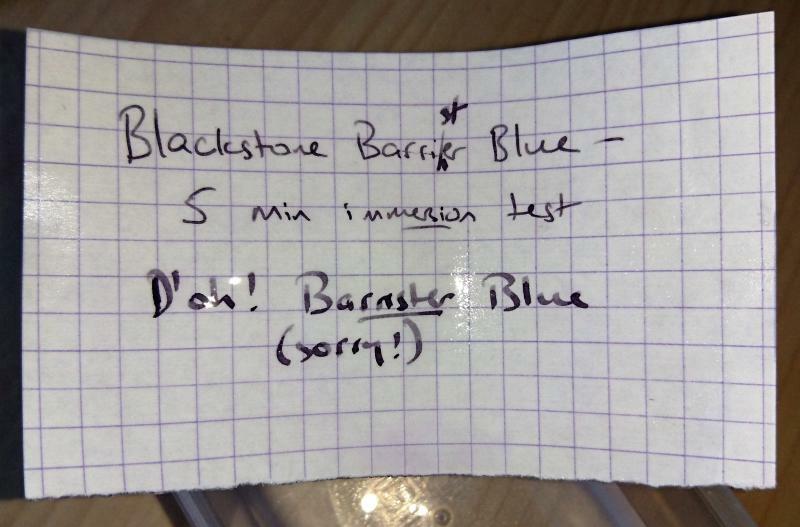 Barrister Blue is a different story: it's a 'stronger', more highly saturated ink, and I've been seriously impressed. Edited by Jamerelbe, 23 July 2016 - 05:33. *Googles. Staedler Noris and then scours Ebay in earnest for one . . . Thanks for the review. And not (I really do NOT need another blue-black ink, but I'm a sucker for them). And this does look like a nice one. You're welcome - and not? !